Bea Tanaka is not just the little sister of superheroine Evie Tanaka. She has super powers of her own: the ability to project emotions onto others and the ability to channel intense anger into a “sonic scream” (or “canary cry,” depending on your taste in comics) which can totally destroy most demon-possessed objects that are attacking. So it’s way past time for Aveda Jupiter and Evie to promote her to full-fledged superheroine and stop treating her like a child. In fact, she has put together a posterboard presentation to convince them of this very thing. To make the point even more compelling, she has used glitter. Lots. Of. Glitter. She even has her own superheroine costume, complete with cape. They totally have to promote her! Heroine’s Journey is the third book of the Heroine Complex series. Like the first two, it is smart, breezy, and snarky. Told in the first person, this time by the aforementioned Bea Tanaka, it follows the ongoing story of our Asian-American superheroines as they protect San Francisco from the threats posed by demons crossing over through portals from another dimension. Bea is now 22, working part-time at a bookstore and hanging out with best friends Leah and Sam. She still lives at the house which serves as HQ for the superheroines Aveda and Evie, but tensions are high between the sisters. Bea knows she is ready to step up. Evie is not so sure. Then, on the same day, two things happen. Demons attack, and Bea is able to step in and make a difference. And, Evie and Bea’s dad returns after 10 years away with virtually no contact. Kuhn really does an amazing job of balancing humor and pathos. Bea’s feelings for her father and her late mother are powerful. Her longing and sorrow drive the character to make some questionable decisions, including hurting people who love her. But Kuhn also shows Bea is usually self-aware, knowing that she is making poor decisions and (usually) able to pull herself back from the brink. She is passionate and proud and simultaneously vulnerable and scared. The characters are the reason to read these books. The plots are cute and funny: demonically possessed rocks and spider-rides from carnivals and killer pens attacking and porcelain unicorns coming to life. (Can anything really surpass the killer demon-possessed cupcakes from the first book in the series? That may be unbeatable.) But Kuhn’s magic is in her characters. I literally cried during one scene near the end when Bea and Evie are having a heart-to-heart. Kuhn writes characters that are truly super. Not just in their fantastic abilities: telekinesis, fire, hair-tentacles, empathic projection, etc. They are super in their feelings, their relationships, their passion, their sexuality, their friendships. Balancing feelings for sisters and lovers and friends and mothers and fathers and enemies is hard in real life. It is seldom done effectively in literature. Kuhn’s characters are transcendent in the power of their emotions. Kuhn is not afraid of conflict or lust or even confusion. Emotions don’t have to make sense. They don’t have to follow a logical progression. Humans, especially those in their early 20s, are allowed to have strong and confusing and sometimes paradoxical reactions to other people. They can and do make mistakes and hurt people and manage to apologize and change and heal those wounds. Seeing it happen on the page makes you really care about these characters. 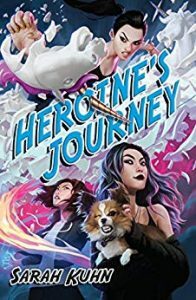 If the Heroine Complex stories are finished, then Heroine’s Journey is an outstanding conclusion. It did not feel like a conclusion, though, and I hope it is not. I feel like there are more stories from these characters, and Sarah Kuhn is the perfect storyteller for them. Read them for the fun, read them for the feels, but read them knowing that in the end you will care more than you thought you would going in. See our reviews of the other stories in this trilogy, Heroine Complex and Heroine Worship.